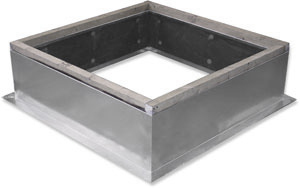 Spinnaker’s welded roof curbs are manufactured of heavy gauge galvanized steel. Seams are continuously liquid welded to guard against water leaks and provide superior structural integrity. Internal insulation is mechanically pinned in place. Standard height provided is 12″. Sloped versions and various heights are available to suit your needs. Optional inner curb liners and aluminum or stainless steel construction can be offered to meet any requirement.